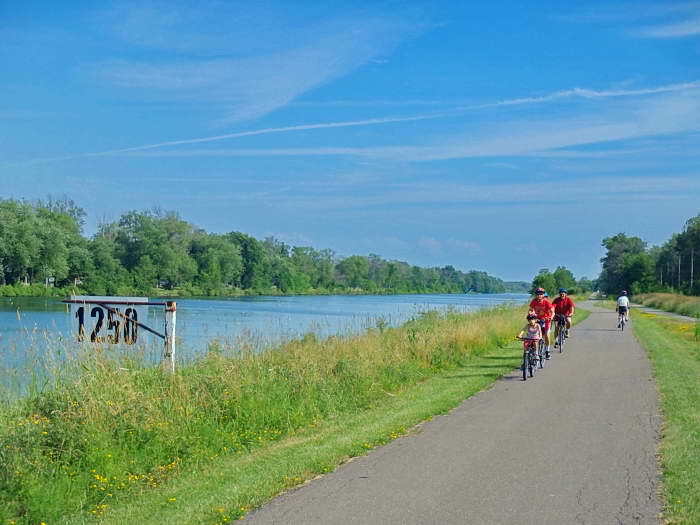 The Welland Canal 42 km bike path makes for a great weekend outing or two. This historic canal from Lake Ontario to Lake Erie is a wonderful, scenic and easy route by the waters edge. The sights are varied along the way. The large freighters drifting down the canal and giant locks are a sight to see. There are stretches of homes, industry, open parkland with the occasional bridge. One follows the canal for most of the way on the west side. Well marked with a few detours this path is paved and wide with room for all. From the top you can start at Lake Ontario by also taking in the George Nicholson Trail another 3km but officially it starts at the first bridge/lock on Lakeshore Rd. As you cycle along the edge of St. Catharines and the canal, you will pass two locks as you start to climb. By the town of Thorold and the third lock you are now going to have to climb the Niagara Escarpment which is a good sized hill. The rest of the ride is easy except for this section. Beyond this, one crosses a few bridges to travel over an island which has natural park land and wooded areas. The path diverts away near the city of Welland to run along the old canal for 14 km before joining up to the main again. There’s an option of riding a path on the opposite side, perhaps on your return. On this section are signs of industry and old bridges no longer needed. At one point the canal is filled in to create a still surface for the boat races at the Flatwater Centre. As you ride south to Port Colborne the path jogs a bit onto an island, across and back to the westside to end at the waters of Lake Erie at a marina and park. There are numerous small towns with amenities along the way to plan a lunch or stay over. I also saw a few free bike repair stations if you need one. Doing the entire length and back can be done at 70 km. But I think many of you will plan to ride one or the other end or perhaps the middle section. This trail can be made into a larger 140 km loop to meet up with the Niagara Parkway which makes for a great weekend loop. An epic long park trail, good for any type of bike and rider. Make it long or a short ride and come back. Hilly on the north end, flat on the south. 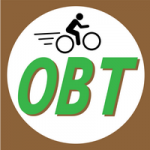 Hey, this may be interesting for you: Welland Canal - Park Trail!